My husband and I love to explore as many different cities as possible on each of our vacations, so seven days cruising from Budapest, Hungry to Passau in Germany on Uniworld’s RIVER EMPRESS was the perfect way to visit several countries, minus the hassle of packing and unpacking each day! Upon our arrival, we were awestruck at the ship’s understated elegance. After being escorted to our stateroom, we immediately relaxed, made ourselves at home and began to explore. We quickly surmised that our fellow passengers were well traveled and from all over the globe. Luckily, open seating at each meal made it easy to get to know many of the guests throughout the cruise. That night, most retired early after traveling all day, but after a fabulous dinner we decided to have a nightcap and dance the night away. Monday started with an escorted bus tour with a very knowledgeable guide through the Pest side of Budapest. Our first stop was at Hero’s Square, a vast plaza in the city center with large monuments and statues commemorating the country’s war heroes and history. Our guide pointed out the city’s famous spas, as well as little cafés that we could later return to on our own. The tour then took us to Buda, the older part of the town overlooking the Danube. We toured Matthias Church, still showing signs of Turkish occupation. 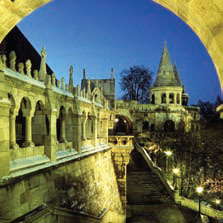 The tour ended atop Fisherman’s Bastion, which formed part of the fortification of the old town. There, we experienced the most amazing views of Budapest and the surrounding countryside. With a couple of hours to stroll around, we visited quaint shops and enjoyed a cappuccino in a local café before taking a leisurely walk across river via the Chain Bridge back to the ship. The tour then took us to Buda, the older part of the town overlooking the Danube. We toured Matthias Church, still showing signs of Turkish occupation. The tour ended atop Fisherman’s Bastion, which formed part of the fortification of the old town. There, we experienced the most amazing views of Budapest and the surrounding countryside. With a couple of hours to stroll around, we visited quaint shops and enjoyed a cappuccino in a local café before taking a leisurely walk across river via the Chain Bridge back to the ship. There, we were greeted with warm towels and hot tea! That evening, we were invited along with three other couples to dine at the Captain’s table for the welcome cocktail party and dinner. Our small group had drinks in the Captain’s lounge with the officers before being escorted to the dining room. We thoroughly enjoyed the expertly served, delicious five-course meal, opting for veal tenderloin and decadent chocolate soufflé for dessert. My husband and I finished the night watching the twinkling lights of Budapest recede from view as we started cruising the Danube. On Tuesday morning, we bundled up from the November chill and went up on deck to watch the ship navigate the Gabcikovo Lock, the largest of the eleven locks that help maintain the water level along the river. After, we enjoyed some seminars and cooking demonstrations as we cruised along and absorbed the scenery, arriving in Bratislava just after lunch. We then ventured off the ship for a tour of the Slovak capital, which included a guided bus trip up to the ancient Bratislava Castle, and walking tour of the old city following the Coronation Route of past Hungarian kings and emperors. The juxtaposition of the old city alongside the concrete Soviet buildings was a curious mix! That evening after dinner, we went to the lounge where local musicians, Pressburger Duo, enthralled us with folk songs and classical pieces on the violin, piano and wood pipes. Their performance ended much too soon as we set sail from Bratislava towards Vienna. Wednesday morning, we docked in Vienna and eagerly disembarked to be transported to the city center. We started with a tour of the gothic St. Stephen’s Cathedral followed by a walking tour. Our guide kept the group fascinated with the history of the country and the Cathedral, and steered us away from the more touristy restaurants and cafés with more authentic suggestions for our free time. Some of the other guests walked to one of the Christmas Markets, while others visited the Spanish Riding School to watch the Lipizzaner horses. Hubby and I preferred to walk along the cobblestone streets soaking up the flavor of the city. Later, we sat in a café, sipped coffee, enjoyed Viennese pastries and were instantly transported to a bygone era. We opted not to go on the tour of Schönbrunn Palace that afternoon, and enjoyed the comforts of the ship instead. The rest proved to be a good idea because after dinner, we boarded a bus to visit the Kursalon, one of the city’s grand concert halls for an unprecedented evening of Strauss and Mozart. After the concert we were taken for a tour of lit-up Vienna by night, which was beautiful and oh, so romantic! Waking Thursday morning, I opened our cabin windows to watch as we cruised past charming little villages before docking in the picturesque city of Dürnstein. Our ship made a short stop for some wine tasting, then set off to cruise through the Wachau Valley. The glass-enclosed Sky Lounge was the perfect spot for us to enjoy a cappuccino while the Cruise Director highlighted the villages and points of interest in this beautiful area. Friday dawned very damp as we arrived in the city of Linz, Austria’s main center for textiles and trade. We took a short trip over the Austrian Alps by bus and spent the day in Salzburg, where the legendary Sound of Music was filmed. Our short, guided tour provided us with a lot of time to stroll through the Christmas Markets, do a little shopping and enjoy Mozart’s birthplace. We woke to a winter wonderland on Saturday as we arrived in Passau, the city of three rivers. Walking through the snowy streets was very poignant because we realized that our trip was coming to an end. As we strolled hand-in-hand, we chatted about the majestic River Empress, the wonderful food and the many new friends we made. 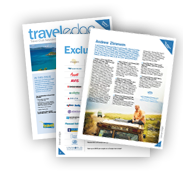 Without a doubt, cruising the Danube through Europe with its many historic sites, incredible architecture and endless activities both onboard and off was the perfect way to romantically reconnect.